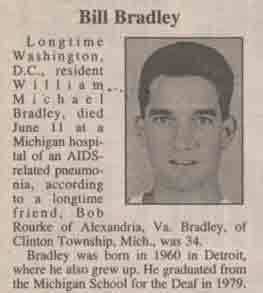 Longtime Washington, D.C., resident William Michael Bradley, died June 11 at a Michigan hospital of an AIDS-related pneumonia, according to a longtime friend, Bob Rourke of Alexandria, Va. Bradley, of Clinton Township, Mich., was 34. Bradley was born in 1960 in Detroit, where he also grew up. He graduated from the Michigan School for the Deaf in 1979. In 1983, Bradley moved to Washington, D.C. He attended Gallaudet University for two years. While in the area, he also worked as a model and a computer operator at Georgetown University, National Governors Association, and New York Life Insurance. In 1991, Bradley moved to Seattle. He began suffering from AIDS-related illnesses and began visiting a hospital that offered services for people who are deaf. When Bradley returned to Michigan in 1992, he found himself in a hospital that didn’t offer these services and fought to improve hospital care for deaf people with AIDS by helping to bring TTY phones and sign language interpreting into Michigan hospitals. In addition to Rourke, Bradley is survived by his mother, Isabelle Bradley Brown of Roseville, Mich.; his stepfather, Jerry Brown; his sisters, Karen Bradley and Margo Bradley of Flint, Mich.; and his brothers, Richard Bradley of Clinton Township, Mich.; and Mark Bradley of Sterling Height, Mich.
Funeral services were held June 14 in Eastpointe, Mich.
William Michael Bradley coped with deafness almost all his life, after suffering an ear infection and high fever when he was six months old. After graduating from the Michigan School for the Deaf, he attended Gallaudet University in Washington, D.C., did some modeling and worked as computer operator at Georgetown University. But when he developed AIDS and was hospitalized repeatedly, he learned about special problems of communication. After being in a Seattle hospital that offered special help for deaf people, he returned to Michigan in 1992 and found himself in a hospital that didn’t provide that help. “He went through a lot of extra pain and suffering because of his hearing handicap.” Said his mother, Isabelle Bradley Brown. Mr. Bradley fought for rights for deaf people in hospitals and helped created the awareness that brought special phones and interpreters into area hospitals, she said. Now, several area hospitals post “a little square patch that looks like a question mark with an ear,” she said, meaning the hospital provides special services for deaf people. “Whenever you see the ears on the door of a hospital, it’s because of William,” Brown said. Mr. Bradley of Clinton Township died Sunday at Mt. Clemens General Hospital of pneumonia associated with AIDS. He was 34. In recent years, he marched for gay rights in Washington and helped raise money for AIDS education, but he was especially concerned about deaf people who had AIDS or were at risk, she said. Besides his mother, survivors include his stepfather, Jerry Brown; three sisters, and two brothers. The funeral will be at 3:30 p.m. today at S.K. Schultz Funeral Home, 21705 Gratiot, Eastpointe.